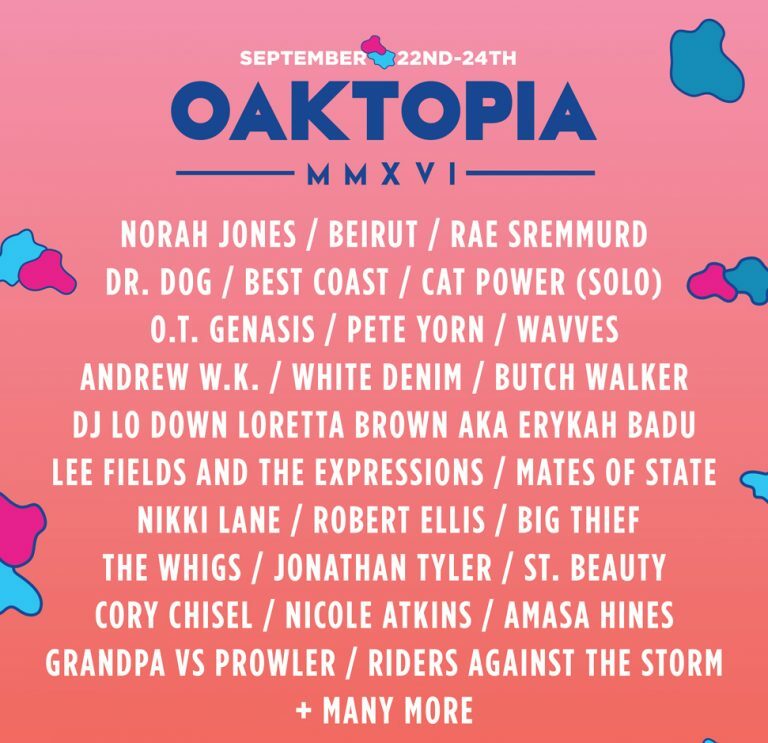 With artists like Erykah Badu, White Denim and Norah Jones headlining Oaktopia, we know you’re gonna be gonna have your hands filled. But there is so much more you can do at the festival. Lauren Menking from KXT’s blog has all the details. Thanks to Lauren Menking for sharing this post with Art&Seek. Look for more music news at kxt.org. But, since Erykah Badu’s set (sadly) can’t last forever, we’re psyched to see there are tons of fantastically fun experiences to be had at the Denton fest this year. 1. Learn about the music industry from expert panelists. Interested in busting into the music industry? Want to know more about how to get your music played? Head over to PAAC on Saturday at 1pm to hear a slate of expert panelists discuss the biz, offer insights on music and venue management, and more. This is a great opportunity for young and local artists to learn from music industry giants about how the industry works on a national and international scale, or for any music buff looking for a glimpse into how the sausage is made. Check back withOaktopia later this month for more specifics on the panelists and topics. Good news for comedy fans — Joketopia is back! 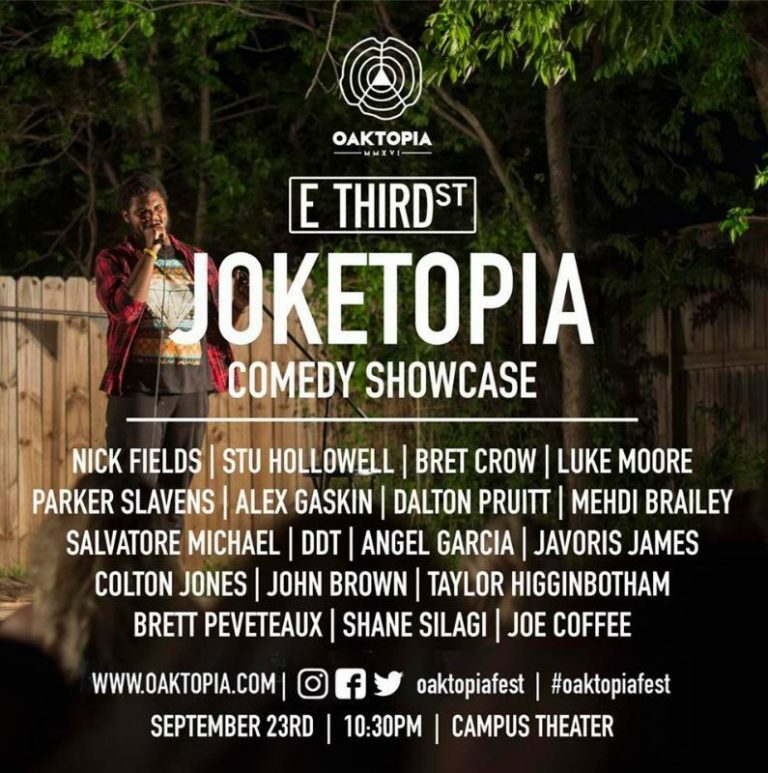 The comedy showcase was a popular experience back in 2014, and returns this year with the help of the Denton comedy collective E Third. So on Friday night — after Norah Jones gently sings you into euphoria — swing by Campus Theater at 10:30pm to top off an already stellar day with sets from 18 of the best local comedians around. 3. Witness some living, breathing (recycled) art. Live art has always been a stalwart of Oaktopia, but this year promises some wild installations like never before. As you’re walking around the square and throughout downtown, keep an eye out for sculptures, abstract and visual art, live murals and other physical mediums taking shape around you. Also, this year Oaktopia is partnering with the Denton Solid Waste & Recycle Department to build a live art piece constructed entirely from waste and recycled materials collected during the festival. Of course, we firmly predict this is the only way we’re going to want to recycle from here on out. 4. Binge on some local film. Here’s an Oaktopia first — film! Granataum Film Festival and Denton Black Film Festival are both teaming up with Oaktopia to bring festival-goers a slate of short films from local filmmakers. Screenings start at 5pm on Friday at Campus Theater. We’re pretty sure “ordinary” and “Oaktopia” have never been used in the same sentence. So it should come as no surprise that the Oaktopia shopping experience promises funky, quirky, carefully-crafted products. From Turkish tapestries to steampunk clocks, don’t miss the treasure trove of unique vendors — both from North Texas and across the country — selling their wares throughout the weekend. Cidem Linen Towel from Oddbird Co. Calling all gamers and/or 90’s kids — this year Oaktopia is partnering with Let’s Play Gaming to take over the Campus Theater on Saturday from noon to midnight for a one-of-a-kind gaming tournament featuring Super Smash Brothers, Madden and Super Mario Kart. This is the perfect chance for gaming enthusiasts to not only play and compete on a big screen, but also a great spot to hang out and socialize with like-minded gamers. Winnings include cash prizes and eternal bragging rights. 7. Go to a step competition on the Courthouse Lawn. Of course, Mario & Co. aren’t the only ones competing during this festival. The UNT African Student Organization (ASO) and Phi Gamma fraternity are teaming up with Oaktopia to host a step competition on Saturday afternoon featuring teams from all across the state. Stop by the Courthouse Lawn from 1pm-3pm to see who will win the cash prize — and to cheer on the home team, of course! 8. Eat. Specifically, eat at Food Truck Fest. In another festival first, this year Oaktopia is teaming up with Food Truck Fest. What’s Food Truck Fest, your stomach asks? Fortunately, it’s exactly what it sounds like. At Oak Street Draft House on Friday at 4pm, 30+ trucks will be parked across the street, offering tasty vittles from the best of the best in Denton’s culinary industry. The event is free to enter, but you’ll want to bring cash or a credit card for food. Crepes, dumplings, tacos…oh my! 9. Attend a fashion show. Raise your hand if you’ve ever intentionally people watched at a music festival just to see the outfits. Yeah…us, too. Which is why we’re pretty excited for The Root Alternative Fashion Showcase — an alternative fashion show featuring an eclectic mix of local boutiques, designers and styles. Stop by PAAC at 11pm on Saturday to check out the latest from local North Texas designers — and also to boogie, seeing as how powerhouse performer Dezi 5 is headlining the show. 10. Marvel at people doing things you can’t do. Er, speaking of people watching…at Oaktopia, performance is certainly not limited to the music. As you stroll through downtown throughout the weekend, keep an eye out for slackliners, jugglers, magicians and other street performers showcasing their many talents. The pop-up performances are, of course, not only fun to watch, but are a great example of all the quirky, unique talent that Denton has to offer. 11. Get your ‘namaste’ on. Let’s be honest. While standing for hours on end to see your favorite artist may be rewarding for your ears and your soul, it’s not exactly gentle on the body. Great news, then, that Oaktopia is providing us ample opportunities to stretch out the kinks and hit the reset button with multiple yoga classes throughout the weekend. Hosted by Karma Yoga, these free form, donation-based classes will take place in the square and in different facilities throughout downtown. Namaste, y’all.